Shop the American Country Home Store catalog for pine furniture that is made in the USA, authentic French bistro chairs, tables, dining sets and more. French bistro chairs, tables and sets - From folding French bistro chairs and tables that can be tucked away and easily stored to non-folding collections, indoor and outdoor sets, you'll add a touch of French flair to your patio, terrace or backyard with bistro sets that are the real thing, made in France by the company that holds the original patent on the basic French bistro furniture. Enjoy comfort and style with French bistro sets that are reproductions circa 1889 from the largest line of patio furniture in Europe, made of quality steel for exceptional beauty and durability. Pine furniture - Transport yourself to an enchanting Parisian street cafe with authentic French bistro chairs and French bistro tables, then embrace the classic elegance of New England pine furniture that is made right here in the USA. From hand-crafted pine TV cabinets to entertainment centers, dining room sets to coffee tables, desks and home office furniture, you'll love showing off solid pine home furnishings that are made by skilled craftsmen and built to last. Wicker furniture - Whether you love the tropical look of rattan wicker furniture or the crisp charm and appeal of white wicker furniture pieces, American Country Home has a comfortably cool collection of wicker furniture sets and styles to dine or lounge on featuring their Bar Harbor Wicker Collection, made from whole-core woven rattan on a solid wood frame that's made to last and last. Choose from wicker sofas, wicker French bistro chairs and tables, dining room sets, outdoor chairs, rockers and a variety of colorful cushions and fabrics that will match and complement any room decor. Slip covered furniture - After you've browsed a selection of fine pine furniture and French bistro dining sets, you'll discover a special line of upholstered furniture that is designed with your life in mind. Brighten up your decor while protecting your furniture with premium slipcovers that fit snugly for optimum coverage without the slippage and loose appearance that you experience with most slipcovers. Take advantage of a unique slipcover system that allows you to change your cover with ease whenever you want, whether it's for a change of season, to incorporate a new look or to throw in the wash. 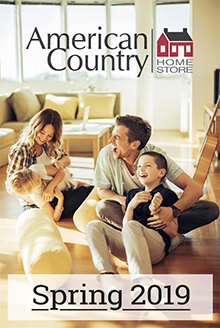 The American Country Home Store catalog brings you exceptional furniture styles showcasing everything from cottage friendly wicker furniture to upholstered furniture slipcovers, featuring authentic French bistro chairs and tables, handsome area rugs and solid pine furniture that is All-American with every piece made in the USA.